What is UPMC Project SEARCH? Modeled on a nationally recognized program developed at Cincinnati Children’s Hospital Medical Center, UPMC Project SEARCH provides students ages 18-21 with real-life work experience based on the individual’s preferences and interests. Students learn these skills while participating in three job training rotations at the host site. The cornerstone of UPMC Project SEARCH is total immersion in a large host business (UPMC). Each school day, students report to the host site for classroom instruction and rotations. Worksite locations are an integral part of the student’s training. These experiences are planned with the host business, student and UPMC Project SEARCH staff. UPMC managers at training sites work with the UPMC Project SEARCH instructor, job trainers and students to teach job skills. Students receive continual feedback on skills and progress. Data collection and progress is discussed at monthly update meetings. Students gain work experience and develop a variety of marketable skills through rotations. Students gain increased independence, confidence and self-esteem. All students leave with either a job at the host site, a job in a related business, or with a team to assist them in obtaining employment. Who is eligible for Project SEARCH? Project SEARCH operates on a school year schedule with applications due the prior school year. Contact for more information. What types of jobs will the student be doing? Students learn basic skills such as stocking, assembling, sanitizing, cleaning, customer service, transporting of equipment and supplies. Students learn support functions in their rotations. Rotations vary but may include departments such as Central Distribution, Dietary, Environmental Services, Pharmacy, Radiology and Respiratory. Who is with the student teaching them the skills? The Project SEARCH instructor, job trainer, and Department Mentor all work together to train and coach the student. Tasks are modeled and the student is expected to learn to work independently. The goal is independence, trainers and coaches will fade and natural supports in the rotation take place. How will the student get to Project SEARCH? Most students begin Project SEARCH being transported by the home school district. It is encouraged and discussed that students should begin travel training and exploring other transportation methods in preparation of an employment outcome. Who selects the students and what is the selection process? The student must visit the host business to observe the culture and possible rotations and to meet the instructor prior to being selected. Next, the school district and OVR counselor recommends the student to the program and an application is sent to the school district. The application is completed by the school with student and parent input then submitted to Goodwill SWPA. The selection committee (representatives from UPMC, OVR, OID and Project SEARCH staff) reviews the applications and the student may be invited for an interview. A maximum of 12 students are selected. Letters of acceptance or denial are sent to all parties. Meet Jack, a UPMC Project SEARCH participant who was featured on Peggy Finnegan's "Proud to be from Pittsburgh" show. 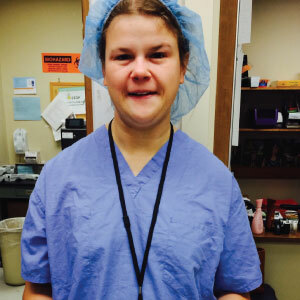 Meet Katie, a UPMC Project SEARCH participant who worked as a sterile instrument technician at UPMC. 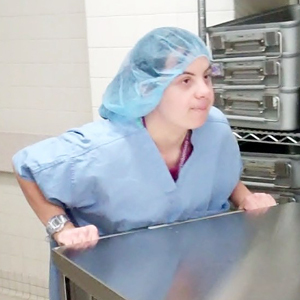 Meet Natalie, a UPMC Project SEARCH participant who just celebrated 8 years of employment with UPMC!